Calling all Professions who love their scrubs! How would you like to win a free scrub set in one if your favorite brands?? 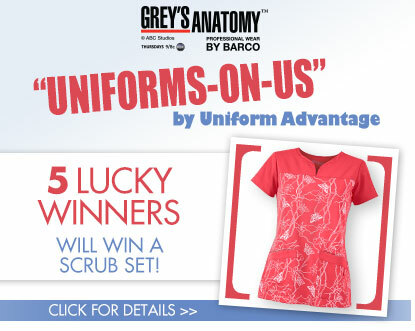 Get the scoop on Uniform Advantage’s UNIFORMS-ON-US contest featuring Grey’s Anatomy Signature Series Collection! This new collection from Grey’s Anatomy Professional Wear features their super-soft arcLux (TM) stretch fabric that is a combination of poly, rayon and spandex blends. It gives you the best of both worlds: a popular brand you love and all day comfort that you never want to not feel. The tops are available in select styles like Junior Fit V-Neck Tops, Junior Fit Two Pocket Tops, Junior Mock Wrap Tops and Long Sleeve Tees and the pants styles include low rise, mid rise and drawstring pants. You can choose from a wide selection of colors like Cabernet Heather, Indigo Heather, Punch Heather, Hot Tamale Heather, Peridot, Watermelon and Citron just to name a few. Enter today and Win a scrub set for yourself! 5 lucky winners will get this Grey’s Anatomy Scrubs Signature Series in a scrub top and pants offered on our website for free! 3. COMMENT on the Facebook post by clicking here, Grey’s Anatomy Scrubs Signature Series page and telling us which is your favorite color in the Grey’s Anatomy Scrubs Signature Series. Once all Facebook comments are in and confirmed that you shared our contest post, we will randomly choose 5 winners (using woobox.com), who will then receive a FREE Grey’s Anatomy Scrubs Signature Series scrub set in the color and style of their choosing! The contest ends Monday 9th June, 2014 at midnight and we will announce the winners Tuesday 10th June, 2014 after 10 am EST on Facebook and our Blog.